5th Place in Abstract Catagory 2004 International Ice Carving Championships. 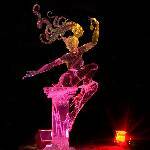 From the 2004 International Ice Carving Championships held in Fairbank, Alaska. This 16 foot tall carving earned 3rd Place in the single block Realistic catagory by a Japanese/US Team. Look in the "NEWS" area for a picture of this while it was under construction.